Sensor Tower published a report today revealing that between January and July, Apple App Store has gained two times more revenue than the Play Store and that too with half as many downloads. 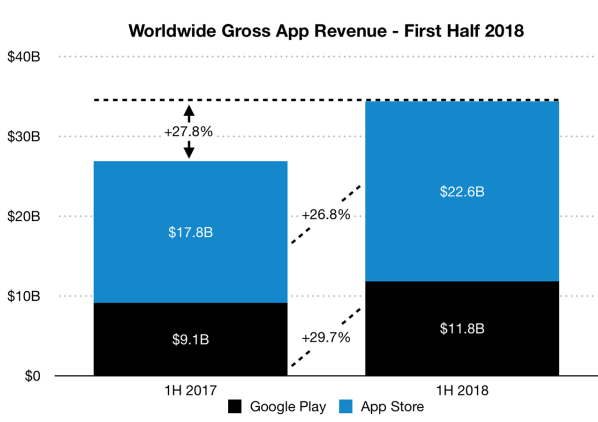 Attaching a dollar tag to the growth, the brand that gives detailed insights in the mobile app ecosystem computed that Apple App Store Revenue 2018 was at $22.6 Billion while Google Play Store statistics showed a revenue number was in the range of $11.8 Billion. It is not uncommon for Apple to generate more revenues from the App Store as compared to the Play Store. Every time discuss App Store vs Play Store revenue, the finding is same – App Store generates more revenue than Android. Last year also ended with App Store reaching $38.5 Billion and Play Store being at $20.1 Billion. There are a number of factors that have been responsible for this occurrence – the demographics that Apple’s business revolve around, the fact that App Store runs in China but Play Store doesn’t, and lastly, the option that Android users have in terms of making purchases from other stores like Samsung Store or Amazon Store. This rise in spending can be traced back to be emerging from the rising trend of subscription-based mobile apps such as Tencent Video, Tinder, and Netflix. Subscription based apps are bringing in huge business for the App Stores, in fact, the apps single-handedly brought in a 77% rise in app revenue in 2017, bringing the store revenue to $781 Million valuations. Wish your Netflix like app to join the league of subscription apps that bring in high revenue for the App Store? Know how much it will cost you to develop a Netflix Clone App. Besides the video streaming apps, gaming apps have also been responsible for bringing a rise in the revenue charts. Till now, Apple’s App Store Revenue chart has witnessed $16.3 Billion coming in from consumer spendings on the gaming apps. The top four apps between both App Store and Play Store were Facebook, WhatsApp, Messenger, and Instagram. The number of app download was more in case of Play Store as compared to App Store. In case of Play Store, it was 13.1% while with App Store it was 10.6%. The finding of Sensor Tower validates the fact that for a business looking to generate money directly from the app, they should contact an iOS App Development Agency and get their App developed and for someone whose business model revolves around getting maximum app downloads, Android App Builders are whom they should contact.